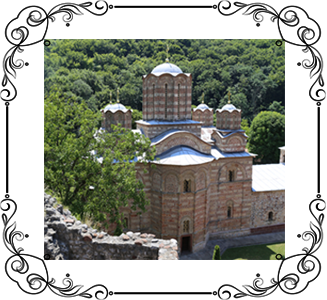 The whole complex of Ravanica monastery, and especially the church, is an architectural entity of unusual importance. Nothing is left of the original monastic cells, which once, as one record tells us, pressed against the walls like birds` nests, nor of the old hospital, barns and refectory. The old walls that once encircled the monastery with their seven towers, one of which had a chapel with frescoes, and seems to have been lived in, are very much damaged. Three of these towers had already been destroyed by the middle of the sixteenth century before Pigafetta`s visit in 1568. With the exception of Chilandarion, which is on Mount Athos and thus outside what used to be the Kingdom of Serbia, Ravanica was the first Serbian monastery to be so massively fortified. Monasteries of this type in Serbia were certainly the result of constant danger from the Turks,a peril made particularly clear by the 1371 catastrophe on the Marica river. The church of the Ascension of the Lord at Ravanica has a characteristic trefoil shape and an unusual open narthex in front of the church. The trefoil plan was well known this region since Justinian`s time, and in Serbia is found again at the end of the ninth century in the churches built on shores of Lake Ohrid and in the town by Sts. Clemens and Nahum, disciples of the apostles Cyril and Methodius. Their design was most certainly influenced by the churches of Mount Athos. The renewed ideal of the true monastic life, as propagated by the Hesychast monks on Mount Athos in the first half of the fourteenth century, was transferred with full intensity to Serbia in the second half of the same century when a hole group of Mount Athos monks, among them the scholar Gregory the Sinaite, took refuge from the Turks in Serbia and were welcomed by Prince Lazar. Of course, Ravanica was not the first fourteenth-century Serbian church built on this plan, but the fact that it was so built most certainly contributed to the spread of the trefoil form which was later adopted for the churches built along the Morava Valley. Ravanica is distinguished from the other Morava churches by its open narthex. This was built partly under the influence of the Gracanica open narthex and partly according to the wishes of the founder. Gracanica was the most important church near Lazar`s personal feudal estates of Novo Brdo, which he controlled before he was chosen ruler of Serbia, after the death of Uros, the last of the Nemanjics, at the end of 1371. The origin of the richly decorative stone carvings which are the second hallmark of the Morava School is a special problem which has not yet been definitely settled. In the churches which were built by Prince Lazar and his wife Milica (Ravanica, Lazarica, Ljubostinja) these carvings are already mature works of art, clearly conceived and consistently executed. Elaborate sculptural decoration in bas-relief frames the doors and windows. Rosettes appear, especially on the western facade. The ornamental stonework is even more lavish in Ljubostinja and takes a good part of the wall space. Floral and geometric patterns predominate. Stylized birds and animals are rarer while human figures and religious subjects are found only occasionally and are of a later date. The execution and style of this sculptured ornamentation are reminiscent of similar decorations found in certain old Russian churches, and in many churches, both older and of the same period, in Georgia and Armenia. For this reason many scholars see the decorative carvings of the Morava churches as merely another influence from the East, especially from Georgia and Armenia. Nevertheless, in spite of the many similarities, this hypothesis seems too arbitrary to offer a really satisfactory answer. The connection between the architecture of the church and decorative stonework is only one aspect of the problem. The choice of ornament and style should also be considered. In style these carvings would seem to be more closely akin to old Byzantine bas-reliefs; to some of the old Serbian sculpture found in various churches (for example, the decorations in Banjska that date from the beginning of the fourteenth century); to the decorative work on certain grave memorials; to craft work in wood and metal;and finally to the pre-Romanesque ornamental sculpture found in the old churches of the Dalmatian coastal towns. The ornaments most often chosen come from the repertory used by early manuscript illuminators, by ecclesiastical master-painters, goldsmiths and wood carvers. What is most certainly new is the lavishness with which this decorative carving was used in the churches of the Morava School. Earlier it was rarer and when used much more restrained. This new use of sculpture on the facades of the churches is connected with the endowments of Prince Lazar. Up to now, in approaching this problem only his surviving foundations have been taken into consideration. We might however get nearer to a solution if we took into account the ruins of the buildings of Novo Brdo, the main fortress of Lazar`s feudal estates, and at the same time one of the largest and richest of Serbian medieval castles. Historical records tell us that it tookten years to complete, most of this time being before Lazar himself came to power. A building site of this kind was certain to have had its own workshops and master-carvers who were able, in work of such unusual importance, to give full rein to their creative skill. Whether or not there was among these stone carvers one from Dalmatia, we are not now in a position to know, although it is very probable. It is possible that Novo Brdo was the connecting link, between their skill in adorning late Romanesque and Gothic churches and buildings with decorative carving and sculpture- and the Orthodox tradition of avoiding high relief and presentations of saints and religious scenes. 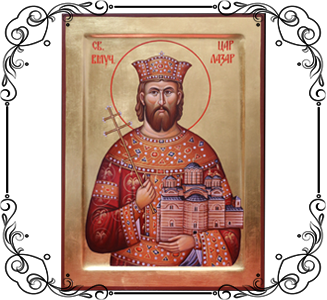 It is almost certain that Prince Lazar in his later endowments in northern Serbia used master-craftsmen who had worked for him earlier on Novo Brdo. Thus Ravanica may be their work. Just at the carved decoration in buildings founded by Lazar shows great similarities, so does painting, not only in his foundations, but also in those of his family. And the paintings in Ravanica are foremost among those of the Morava churches.